Crazy cheap, yet good sound and it's a Behringer?!?!?!? I am NOT a Behringer fan. IMHO their products haven't been worth even their super cheap prices for over a decade. But wow, this little digital board sounds pretty darn good and has all the stuff you would need for a super low price. I have been using it's internal wifi system, which works pretty well. I need to fool around with getting it hooked up to my existing wifi, but so far so good. The software works pretty well on my iPad. Nothing for an iPhone...but I hear it has a Galaxy phone app. We have a wedding DJ, Photography and Video service and this makes our job really easy. Now we just use a usb drive to record the speeches right out of the mixer. Being able to put a built in compressor on the mics is another great feature. If someone spills a drink on your iPad that you use to control the mixer all is good. 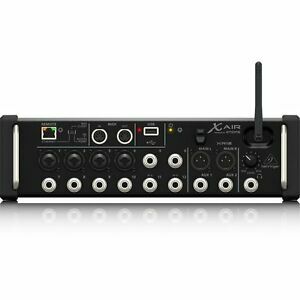 Even if you have a hardware DJ mixer, just plug the outputs into this and use the mic pres for the you and the speeches. The flexibility at this price range in really amazing. Audio quality is great, app spread is easy. Connectivity and internal routing are great. I only wish I had the bigger unit for multitrack recording instead of this unit's 2-track stereo bounce. BUT even the 2-track recorder is routable and assignable. Well done.